Left Behind! Exposing the Rapture! 1. The Church could be raptured at any moment, but before the tribulation. 1. The church is raptured only after the great tribulation. 2. The Rapture is a secret, stealthy event 2. The Rapture is an open, manifest event. 3. 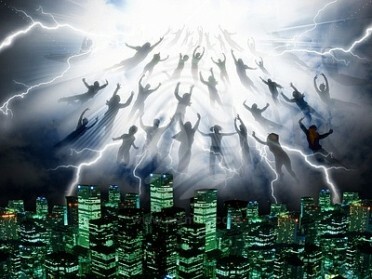 Only Christians since Pentecost are Raptured. 3. All Old Testament and New Testament saints take part. 6. The Restrainer of 2nd Thessalonians 2:7 is the Holy Spirit. 6. The Restrainer is not named, but is not the Holy Spirit. 7. The Pre-tribulation Rapture is the “blessed hope of the church.” 7. The “hope” of the Church is the post-tribulation return of Christ in great glory and power. 8. The total Second Coming of Christ involves two or more parousias of Christ. 8. The total Second Coming of Christ involves but one parousias. 10. The Day of Christ is not the same as the Day of the Lord. 10. The Day of Christ and the Day of the Lord are one and the same. 11. Christ must come for the Church before He can come with it. 11. Christ comes with the Church at the same time that He comes for it. 13. The elect in Matthew 24 are the Jews 13. The elect in Matthew 24 are Church saints, both Jew and Gentile. 14. Christ’s wrath includes the tribulation. 14. God’s wrath comes after the tribulation. According to Amos 3: 7, Yah does nothing without first revealing it to his prophets. And those who have returned to the Hebrew roots of our most holy faith know that since the 4th day of Creation, Yah has made known His Appointed Times through the luminaries he placed in the expanse of the heavens. These mo’eds (Genesis 1:14) -in most English Bibles rendered as seasons- are translated elsewhere in Scripture as meetings or as Feasts. Mo’ed can mean an appointed time, an appointed place, or an appointed occasion. Knowing that God keeps His appointed times, we can rest assured that Yeshua will not return at any moment, but at the predetermined moment on a future Feast of Trumpets, Yom Teruah, known by the Hebrew idiom as that time which no man knows the day or hour. It’s because this first of the yet-to-be-fulfilled fall feasts, commencing on the first day of the seventh month, is the only feast determined by the sighting of the first sliver of the new moon. And this occurs at some point over a two day period. So we don’t know the day or the hour in which this new sliver of moon (new month) will be sighted. Therefore, though we can be certain of the season, the exact day must be watched for. 1Th 5:1-6 But concerning the times and the seasons (Mo’ed/ appointed times), brethren, you have no need that I should write to you. (2) For you know perfectly that the day of the LORD so comes as a thief in the night. (3) For when they say, “Peace and safety!” then sudden destruction comes upon them, as labor pains upon a pregnant woman. And they shall not escape. (4) But you, brethren, are not in darkness, so that this Day should overtake you as a thief. (5) You are all sons of light and sons of the day. We are not of the night nor of darkness. (6) Therefore, let us not sleep as others, but let us WATCH and be sober. 1Co_15:52 … in a moment, in the twinkling of an eye, at the last trumpet. For the trumpet will sound, and the dead will be raised incorruptible, and we shall be changed. 1Th_4:16 For the Lord Himself will descend from heaven with a shout, with the voice of an archangel, and with the trumpet of God. And the dead in Christ will rise first. We also know from Matthew 24:27 that it will NOT be a secret stealthy event. For as the lightning comes from the east and flashes to the west, so also will the coming of the Son of Man be. And it will not be BEFORE the tribulation! Matthew 24: 29-31 says, “Immediately AFTER the tribulation of those days the sun will be darkened and the moon will not give its light. The stars will fall from heaven and the powers of the heavens will be shaken. THEN the sign of the Son of Man will appear in heaven, and then all the tribes of the earth will mourn, and they will SEE the Son of Man coming on the clouds of heaven with power and great glory. And He will send His angels with a great sound of a trumpet, and they will gather together His elect from the four winds, from one end of heaven to the other. Read my article The Greater Exodus Not the Rapture to understand who He is gathering, and where they will be going. They shall come with weeping, and I will lead them with prayers. I will cause them to walk by rivers of waters, in a right way; they will not stumble in it. For I am a father to Israel, and Ephraim is My first-born. Hear the Word of Yehovah, O nations, and declare in the coastlands far away, and say, He who scattered Israel will gather him and keep him, as a shepherd his flock. The event that Sunday Christians call the Rapture, a word found nowhere in the Bible, is scripturally known as the Resurrection and the Day of Yahweh (the LORD). For Scripture teaches that at the end of this current age, which culminates with the tribulation, Yeshua will return. The dead in Messiah will be raised first, with glorified bodies. Then those of us who are alive and remain will put on immortality. Together we will rise to meet Yeshua in the air as He returns to earth the second time to save Israel, pour out His wrath on His enemies, and to marry His bride. ay a harp on a pink cloud. His return is about the RESTORATION of all things, about reversing the effects of Adam’s fall. We will be eating from the Tree of Life that was in the Garden. So what does “meet him in the air” refer to? Simply this: In ancient times when a dignitary came to town, a reception party would always go outside the city gates to meet him, to usher him in. It’s that simple! Now back to the Day of the LORD. Isa_34:8 For it is the day of the LORD’s vengeance, The year of recompense for the cause of Zion. Oba_1:15 “For the day of the LORD upon all the nations is near; As you have done, it shall be done to you; Your reprisal shall return upon your own head. Zep 2:2-3 Before the decree is issued, or the day passes like chaff, Before the LORD’s fierce anger comes upon you, Before the day of the LORD’s anger comes upon you! (3) Seek the LORD, all you meek of the earth who have upheld His justice. Seek righteousness, seek humility. It may be that you will be hidden in the day of the LORD’s anger. Notice that the verse does not say to pray that we are taken out of the world to Heaven, but that we should pray to be hidden during the Day of the LORD. Yeshua also prayed to the Father, in John 17:5, and asked Him not to take those who are His out of this world but to protect them. Dan 11:31-35 And forces shall be mustered by him, and they shall defile the sanctuary fortress; then they shall take away the daily sacrifices, and place there the abomination of desolation. (32) Those who do wickedly against the covenant he shall corrupt with flattery; but the people who know their God shall be strong, and carry out great exploits. (33) And those of the people who understand shall instruct many; yet for many days they shall fall by sword and flame, by captivity and plundering. (34) Now when they fall, they shall be aided with a little help; but many shall join with them by intrigue. (35) And some of those of understanding shall fall, to refine them, purify them, and make them white, until the time of the end; because it is still for the appointed time. (37) He shall regard neither the God of his fathers nor the desire of women, nor regard any god; for he shall exalt himself above them all. (38) But in their place he shall honor a god of fortresses; and a god which his fathers did not know he shall honor with gold and silver, with precious stones and pleasant things. (39) Thus he shall act against the strongest fortresses with a foreign god, which he shall acknowledge, and advance its glory; and he shall cause them to rule over many, and divide the land for gain. (40) “At the time of the end the king of the South shall attack him; and the king of the North shall come against him like a whirlwind, with chariots, horsemen, and with many ships; and he shall enter the countries, overwhelm them, and pass through. (41) He shall also enter the Glorious Land, and many countries shall be overthrown; but these shall escape from his hand: Edom, Moab, and the prominent people of Ammon. (42) He shall stretch out his hand against the countries, and the land of Egypt shall not escape. (43) He shall have power over the treasures of gold and silver, and over all the precious things of Egypt; also the Libyans and Ethiopians shall follow at his heels. (44) But news from the east and the north shall trouble him; therefore he shall go out with great fury to destroy and annihilate many. (45) And he shall plant the tents of his palace between the seas and the glorious holy mountain; yet he shall come to his end, and no one will help him. (Dan 12:1-3) “At that time Michael shall stand up, the great prince who stands watch over the sons of your people. And there shall be a time of tribulation such as never was since there was a nation, even to that time. And AT THAT TIME your people shall be delivered, everyone who is found written in the book. (2) And many of those who sleep in the dust of the earth shall awake, some to everlasting life, some to shame and everlasting contempt. (3) Those who are wise shall shine like the brightness of the firmament, and those who turn many to righteousness like the stars forever and ever. Dan_7:21-22 “I was watching; and the same horn was making war against the saints and prevailing against them, until the Ancient of Days came, and a judgment was made in favor of the saints of the Most High, and the time came for the saints to possess the kingdom. Dan_7:27 Then the kingdom and dominion, and the greatness of the kingdoms under the whole heaven, shall be given to the people, the saints of the Most High. Rev 21:2-3 Then I, John, saw the holy city, New Jerusalem, coming down out of heaven from God, prepared as a bride adorned for her husband. (3) And I heard a loud voice from heaven saying, “Behold, the tabernacle of God is with men, and He will dwell with them, and they shall be His people. God Himself will be with them and be their God. Rev 21:22-27 But I saw no temple in it, for the Lord God Almighty and the Lamb are its temple. (23) The city had no need of the sun or of the moon to shine in it, for the glory of God illuminated it. The Lamb is its light. (24) And the nations of those who are saved shall walk in its light, and the kings of the earth bring their glory and honor into it. (25) Its gates shall not be shut at all by day (there shall be no night there). (26) And they shall bring the glory and the honor of the nations into it. (27) But there shall by no means enter it anything that defiles, or causes an abomination or a lie, but only those who are written in the Lamb’s Book of Life. In closing, I would like to share the parable found in Matthew 13: 38-42. It gives a whole new meaning to being LEFT BEHIND. The field is the world; the good seed are the children of the kingdom; but the tares are the children of the wicked one. The enemy that sowed them is the devil; the harvest is the end of the world; and the reapers are the angels. As therefore the tares are gathered and burned in the fire; so shall it be in the end of this world. The Son of man shall send forth his angels, and they shall GATHER OUT of his kingdom all things that offend and those who practice lawlessness, and shall cast them into a furnace of fire. Thanks for sharing. The Father of our Lord Jesus Christ (Yeshua) is REAL! The sweet sweet Holy Spirit in us giving by the Father to those that ask IS REAL! He leads and guides us into all truth. There is wisdom in listening to others.Yet if you follow man you get what he/she sees and believes. There is no ONE group that has the 100% all in all gospel. You can go from Baptist to Word Of Faith then to those that believe as Bulldozerfaith does. Each KNOWS there right. Man.. its like that OLD SHOW well the real Yeshua please stand up. I have been bless to see wonders from my Father yet I sin more then most. His grace His mercy .. by the blood of Yeshua I am washed. Yet I get to the point saying.. Father I want to quit. Each says they know you.. each has heard from you has something AWESOME happen..yet ALL are so divided. Like Rapture (Caught up) Each will tell you why it iS and why it is NOT. Each can prove why they are right and the other is wrong. So ask.. can’t I just pray and ask the Father in Yeshua’s name? See what has worked for me is it HAS to be 100% written. I dont care WHO talks to me meaning voice, dream, vision. It WILL tell me if its of GOD Yeshua came in the flesh born virgin Mary. Died on the cross for the worlds sins was buried. Rose the 3rd day and is the only way to the Father. So for me.. Yeshua said HE was going back to the Father to make a place for me (US) and if He went HE would come back and get me/take me (US) so where He is we will be. What some leave out is this… DONT believe me. Dont take my word for anything. YOU ask you seek and HE WILL Find you TALK to you. So do what HE said not them not me.. HIM. He told YOU to watch and pray. He told you to expect Him. So when will He come? It will always be NOW! Dont let the enemy or man rob you of what HE said. He is coming and if you tell HIM I dont believe in this “Caught up/rapture” thing. Dont worry then.. you will be here till the end. A time that has not been nor every shall be. And if you cant live for Him now..you never will then. See I dont follow pre mid or post.. I watch and pray and am ready NOW. It ill always be NOW when He comes. He told me He was going to come get me. So Why would I believe man telling me what Yeshua really meant. He is coming.. and I will never miss Him. Look how many have the REAL Yeshua.. the real truth. Yeshua (Jesus) is real. He came ..He died for YOU not them no me.. He did for YOU! Made all you see as if YOU were the only one. Please.. stay in His word.. and just ask and pray..HE will show you where its written. Jesus is coming…for those that watch are ready. IF I have offended in any way forgive me. I want you to keep your eyes on Jesus.. He knows your heart He knows WHO you are calling on.. Yeshua\Jesus.. He is.. He was He is He always shall be.. and EVERYTHING in between. Rejoice.. this is the best time to be alive. He put you here for a reason. Dont go by what you feel or see or hear. Walk by Faith.. walk in the spirit.. pray pray in the spirit.. 24/7.. keep His word before you 24/7. ALWAYS love show mercy grace and forgiveness. NEVER speak negative of others. Love them.. if they are in error.. HELP THEM..dont toss them away.. they are family if they believe in Jesus.. Thanks Christine, for sharing and all your hard work. I have always enjoyed your teachings and do share some of them. I will make sure to include this one on my website. There are so many in the church to reach with the truth, but if each one of us do share the Good News there’s a chance. Shalom sister and have a blessed Sabbath day. Thanks, Sharon! You have a blessed day too! Oh, but there is something you can do. And it won’t cost you one red cent. PRAY! Praying is the simplest, yet HARDEST thing for believers to do. And everyone can do it, but so many believers don’t. It is spiritual warfare. So don’t ever say there is nothing you can do. There is! Money is tight for me these days too, since I have retired (I am 63) and only work part time now. But Yah has been showing me how very important a disciplined prayer life is. We do not always get to see the answers, but prayer does change things….so be diligent! You are needed in the war against Ha Satan! Well written and clear. Thank you Christine. A Danish friend of Jewish background bought your book “Miracle Across the Sound’ on my enthusiastic recommendation and said it was wonderful. My friends family come from Jutland but now she lives up near Aberdeen. She was the youngest person employed by the British Foreign Office when she worked at the Copenhagen Embassy just after WW2. Thank you again for all your informed writings. Bill Pentecost. That is awesome! Thanks for recommending my novel, Miracle Across the Sound! I LOVE the fact that a Dane has read the novel and loved it! You have made my day! Bless you! It’s a good teaching. Appreciate all the scripture references. This allows those of us,who so choose, to be like the Bereans. Study it out to affirm our faith! Thanks to Christine For ALL of her research and explanation !! Now we will read the teaching on ..’The Greater Exodus’. Shalom and YAH Bless !! !